How did National Sovereignty and Children’s Day in Turkey become the International Children’s Day? In Turkey 23rd April is celebrated as Children’s Day since the founder of the Turkish Republic, Mustafa Kemal Atatürk, presented it to all the children of the world. His vision was that children will be the creators of our future. During the War of Independence, the Grand National Assembly met in Ankara and laid down the foundations of a new, independent, secular and modern republic from the ashes of the Ottoman Empire. On July 24th 1923, Ataturk began the establishment of the new state. Over the next eight years, Ataturk and his followers adopted sweeping reforms to create a modern Turkey. In unprecedented moves, he dedicated the sovereignty day to the children and entrusted the protection of this sovereignty and independence to the children. Every year, the children in Turkey celebrate this “Sovereignty and Children’s Day” as a national holiday. Schools participate in week-long ceremonies marked by various folk dances and other performances in all fields in large stadiums watched by the entire nation. Among the activities on this day, the children send their representatives to replace state officials and high-ranking civil servants in their offices. The President, the Prime Minister, the cabinet ministers, provincial governors all turn over their positions to children’s representatives. These children, in turn, sign executive orders relating to educational and environmental policies. On this day, the children also replace the parliamentarians in the Grand National Assembly and hold a special session to discuss matters concerning children’s issues. The importance of April 23rd as a special day of children has been recognised by the international community. As a result of this celebration, UNICEF decided to create an International Children’s Day. The day is celebrated on various dates in different countries. For instance, the International Day for Protection of Children is observed in many countries on 1st June since 1950. It was established by the Women’s International Democratic Federation on its congress in Moscow. The United Nations choose to celebrate Universal Children’s Day on 20th November. Many of the TTC wetranslate team have children or younger brothers and sisters of their own and we all agree that the youth can establish the global harmony that is essential for a bright future. 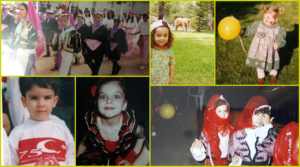 The photo is a collage showing our colleagues’ childhood years celebrating this festival.